I am sure that by now it’s pretty obvious how much I love finding ways to make typically store bought things at home. Pretty much everything I make and blog about can technically be classified as “homemade” since, well, I make it all at home mostly from scratch. But I’m talking about the posts where I recreate things that you normally associate with store bought brands. Like when I made Milano Cookies, Oreos, Funfetti Cupcakes, Fish Sticks, Hamburger Buns, and Mayonnaise. Now that I’m in China and certain kitchen staples are a little harder to come by, you will probably find a lot more of these kinds of posts. 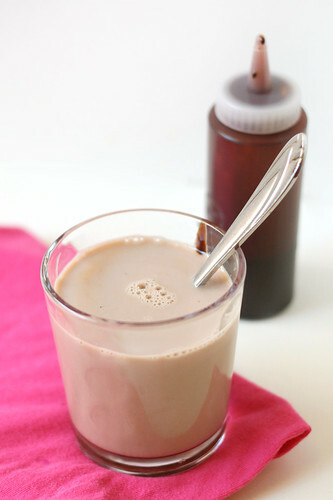 I am a nut for chocolate milk. Like at least a glass a day, sometimes two, kind of nut. So when Annie posted a recipe for homemade chocolate syrup a few months ago, I felt like a little kid on Christmas morning. I knew it would be love at first sip, and it was. I may or may not have drizzled a little directly into my mouth from the squeeze bottle. Rich chocolaty goodness! And of course, as I have found with a lot of DIY foods, it is so much easier than I thought it would be! As with most things, the quality of ingredients you use will directly relate to the results that you get. Using Hershey’s cocoa powder won’t mean that your syrup is bad or gross, but it won’t be quite as good as if you use a better brand. I had Ghirardelli on hand, which isn’t the highest quality in the market but is a step up, and my results were great. In a medium sauce pan, whisk together the sugar and cocoa powder, making sure to break up any lumps in the cocoa. Turn the heat to medium-high and stir in the water and salt. Bring to a boil, stirring frequently. Once it has reached a boil, reduce heat to low and continue to simmer for 5 minutes, stirring occasionally, allowing the mixture to thicken. Once the mixture has thickened remove the pan from the heat and let cool for 5 minutes. Stir in the vanilla. Store in the refrigerator. 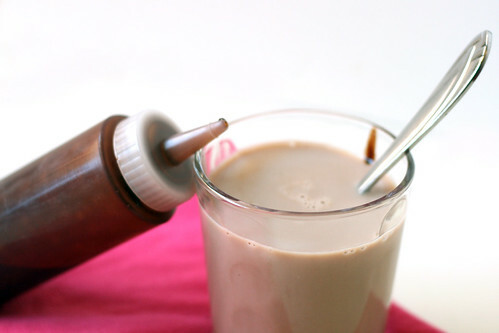 Use for chocolate milk, ice cream topping, brownie topping, or any recipe that calls for chocolate syrup.